As a friend or loved one of the family, it can be difficult to find the right thing to do or say. The death of a child is devastating, and it may seem that nothing can be said to soothe any of the pain. However, providing support can be incredibly meaningful to the family during such a hard time. It is normal that you may feel uncomfortable, but it is important to take the time to listen and show compassion. You may be tempted to avoid the parent or avoid mentioning the loss of the baby because you are uncomfortable. It is far better to address the subject than to pretend nothing has happened. "I'm sorry", is always a good way to start. Speak from your heart. Tell your friend that you care. Tell him/her that you imagine it must be difficult and let them know you are willing to listen. Remember the loss of a child affects both partners and that each need support. Some of the condolences commonly offered to grieving parents tend to minimize the baby's importance. Others try to explain why the baby died- something that can usually not be explained. Try to avoid the cliches such as, "It's for the best", "You can have more children" and "At least you didn't get to know the baby too well". Do not have the expectation that a parent should be "over it" and move on after a short period of time. People move through the grieving process at their own pace. Grieving the loss of a baby may take months to years. 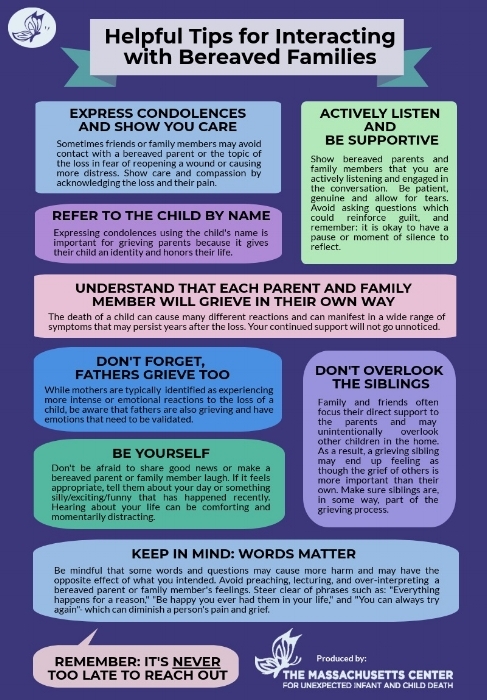 Click here for helpful information on what to say/what not to say to grieving parents. Let the parents talk about the baby if they want to. It is normal for you to feel some discomfort, as a baby's death is not an event that many people have experienced. Try to overcome your discomfort and let your friend know you are available to listen. If possible, offer to help in practical ways such as preparing meals, driving other children to school or after-school activities, babysitting, grocery shopping or doing housework. Don't push him/her to participate in social activities, but continue to invite him/her. Your ongoing friendship with someone who has lost a baby will mean a lot to a grieving parent. You may feel helpless because you are not able to make everything "okay". But by offering your support, compassion, and time, you are helping more than you will ever know. The following link is an interview with Sheryl Sandberg, Facebook COO who unexpectedly lost her husband. She discusses how to help someone who is grieving. Her book, Option B, can be purchased on Amazon. the Family Help and Healing Fund, and the Christina Pike Meisner Memorial Endowment Fund.